Now that is out of the way…. Let’s get back to the topic on hand! Using Sage CRM to get a list of details about your CRM records. This could be Lead Details, Companies or People. Using groups in Sage CRM, you can get all of the information you need in a format that can be exported to Excel, CSV. It can even be used to create a mass email. As it is Christmas eve, I am going to use the example of sending out Christmas Opening Times to a group of customers. The first thing you need to do is to decide which entity the group is based on. Is it individual people, companies, or leads? Once you have decided this, you can then continue with making your group. You need to go into My CRM and then go into the Groups tab, which you will find along the top. Alternatively, you can right-click (or hover depending on settings) on the My CRM button and select Groups. Once you are in the Groups tab, you will be able to see any existing groups. You will have the option to create a new group with ‘New Group’ button on the left-hand side. If you have made it to here, then you are doing well so far! If your looking at this all confused then get in touch with our support team! The new group creation is split up into 4 stages. Type: Dynamic or Static. A dynamic group is always up to date as new records are added and removed. A static group takes a screenshot at the point of creation so will not be updated unless the group is modified. Available To: Who will the group be available to? Private is just yourself. Info Admin will show to all users that have this right. All users is exactly what it says on the tin! Entity: This is the important very important selection on this screen. You need to know which entity the group will be based on. Do you want People? Companies? Opportunities? This selection will determine which fields are available to you and how the group behaves. Source View: This will appear once an entity has been selected. These are views that are available to use and will further determine the fields that are available to use. 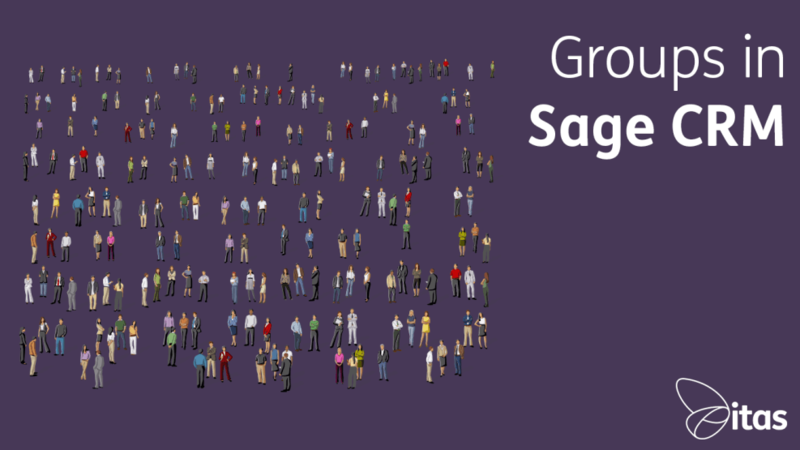 The next step to creating a group in Sage CRM is to select what fields you want in the group. The first selection box contains a list of all of the fields available for the group. You can select a field in the list and then click whether you want the field to be a ‘Group Contents’ field, a ‘Search Criteria’ or a ‘Sort By’. These are the main functions and these are summarised below. There is also an advanced find option and a key attribute option. These options; however, are not covered in this post. Search Criteria: The fields that are selected as search criteria are used to determine which data is returned. E.g. territory to filter the data to only return the records in a specific territory. Sort By: These fields will be used to sort the returned records. The order in which they appear on the list is the order in which they will be sorted. E.g. Company Name, City. This will sort firstly by the company name and then by the city. This stage will only be used when the advanced find option is selected. This stage will show a preview of the records that will be returned along with all of the group details. From this point, you can choose to save the group, go to the previous screen or cancel the group creation. It’s great having a group with a list of records that you need, but what would make them really useful is the ability to use the data in various different ways. Sage CRM allows you to use the data to achieve your desired outcome. If it is sending cards you can export the data to CSV and import it into an address book or list of recipients. You can create letters and use the mail merge functionality to auto-generate some fields on the letter to make them more personal to the recipient and you could also use this feature to generate address labels. Another function is to be able to send emails out from a group. This will send an email to all records with a valid email address, providing this field is included in the group contents. This allows you to send updates out to a group of contacts quickly and effectively. A mass update will allow you to update fields that have been included in the group contents for all of the records returned. Finally, you have the ability to generate the SQL script for the group. When entered as a query is SQL this will return the same list produced in Sage CRM. You can also use this to create new views or pull data directly from the tables. Do you need more information on how you can use CRM to your advantage? Maybe you have Sage 200 but are interested in using the free Sage CRM user available to you? Contact one of our Sage CRM consultants on support@itas.org.uk and we can help to improve the efficiency of your business through CRM or even just help you create that Christmas Card list you really need?